Flaky, buttery, golden outside, delicious croissant dough filled with melted dark chocolate. A foolproof recipe for chocolate homemade treats. Combine warm milk, sugar and yeast in the bowl of your stand mixer. Let this stand until thick and foamy, about 5 minutes. Add flour and salt to the yeast mixture. Mix on low speed for about 7 minutes, until the dough is smooth and soft. Transfer dough into a clean, floured surface and knead briefly for about two minutes, adding flour a little at a time as necessary. Pat and shape the dough to a 1 and 1/2 inch thick rectangle. Wrap it in plastic wrap and chill in the fridge for 1 hour. While the dough is in the fridge, prepare the butter. Cut butter into sticks, and arrange them in a neat block. With a rolling pin, pound the butter so that it becomes malleable. After chilling the dough, unwrap it and roll it into a 16 x 10 inch rectangle. Lay the butter block on the center of the dough. Carefully pull each corner of dough over the edge of the butter and to the center of the butter, pressing down so no air is trapped. Pinch the edges of dough together once the butter is fully covered, sealing the butter inside the dough. Roll the dough to form a 15 x 10 inch rectangle. Fold the dough again, business letter style. You now have completed one fold. Chill the dough in the fridge for 1 hour, wrapped in plastic. Repeat this rolling and folding three more times. Once you have chilled your croissant dough, divide it in half horizontally and put one half back in the fridge, wrapped tightly in plastic wrap. Dough should be between 1/4-1/2 inch thick. Using a sharp knife or pizza cutter, divide dough into 5 or 6 even long strips about 2-3 inches wide each. 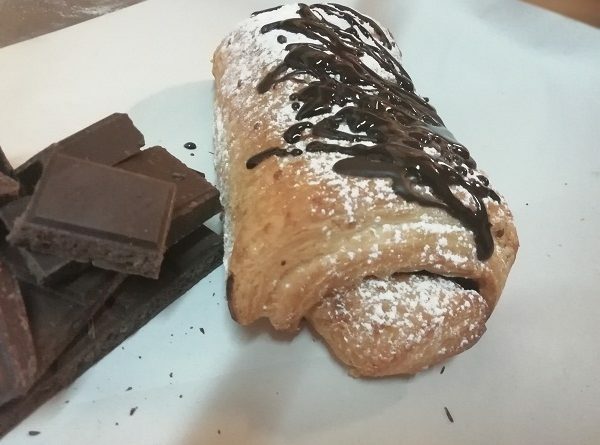 Chop the chocolate bar into chunks so you can divide them evenly among the croissants, with 2 strips in each. Place the two logs of chocolate down on the dough, one inch from the closest end to you, and the other two inches further from the first. Starting at the end closest to you, gently roll the dough over the first piece of chocolate, and continue rolling over the next, and all the way to the end. Set the croissant onto a parchment lined baking sheet with the end of the roll on the bottom. Let croissants rest in a slightly warm place for 1 hour. Prepare egg wash by whisking 1 egg and 1 tablespoon heavy cream. Gently apply a thin layer onto each croissant with a pastry brush. Bake sheets one at a time for about 30 minutes, rotating the pan after 15 minutes. Serve with sugar and melted chocolate.